Cholangiocarcinoma, gallbladder, and bile duct cancers represent a family of diseases that occur in the liver, gallbladder, and bile ducts and share many common features as well as a common way of spreading. Cholangiocarcinoma, Gallbladder, and Bile Duct Cancers Treatment and surgery is planned according to the tumor location and how advanced the disease is. An extremely thorough workup looking for distant spread is mandatory before any surgery is attempted. Unlike with colorectal and ovarian cancers, surgery for these tumors has not shown significant benefit if the cancer has spread to a distant site. Patients and medical professionals from America and around the world seek out his specialized best in class individualized treatments and services including his expert surgical management of the patient’s condition. Our best in class staff regularly performs individualized Cholangiocarcinoma, Gallbladder, and Bile Duct Cancers Surgery on patients with these cancers and have acquired more than a decade of operating experience in this field. 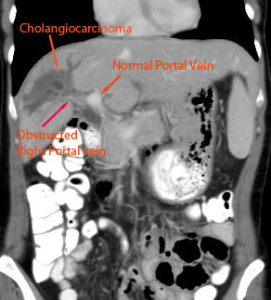 For example, the image to the left represents Right Intra-Hepatic Cholangiocarcinoma invading Right Portal Vein and causing atrophy of the Right Lobe of the Liver and hypertrophy of the Left and Caudate Lobes. From a technical standpoint, cholangiocarcinoma, gallbladder, and bile duct cancer tumors represent possibly the most challenging oncological surgery cases. Although they rarely grow large, these tumors are commonly invading or are in direct contact with the liver’s most vital structures. The oncological surgery therefore requires a high level of skill, technical expertise, and in-depth knowledge of the liver anatomy as well as all its multiple variations that are so common. The entire bile duct is almost always removed during the surgery, and a highly complex reconstruction is required to connect any remaining bile duct (often multiple small ones) to a specially constructed loop of intestine (Roux-en-Y anastomosis). In some cases it is necessary to remove a portion or an entire lobe of the liver. The most advanced tumors would demand removal and reconstruction of blood vessels (most commonly the portal vein and/or hepatic artery). The quality of the resection achieving “negative margins” (leaving no cancer behind) is the most important prognostic factor for future survival. In summary, cholangiocarcinoma and bile duct cancer surgeries are of extremely high complexity and leave very little room for error. In addition to on-site consultations, Dr. Alden offers remote consultations to patients and medical professionals anywhere in the world via phone or SKYPE. Please follow this link to learn more: remote consultations. 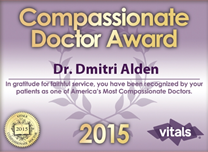 Please phone Dr. Dmitri Alden’s NYC office (212) 434-6216 for details pertaining to remote consultations.